First meeting at ‘Electric Lady Land’ on Chapel Street, Lachy thought Ellen looked hot and seemed fun to talk to. Ellen found Lachy to be kind of quiet, but she liked the way he ran his fingers through is hair, so after discovering a mutual appreciation of good food & wine, they bonded over the fact that they had both worked at wineries, both shared a love of animals, and both enjoyed each other’s company immensely. 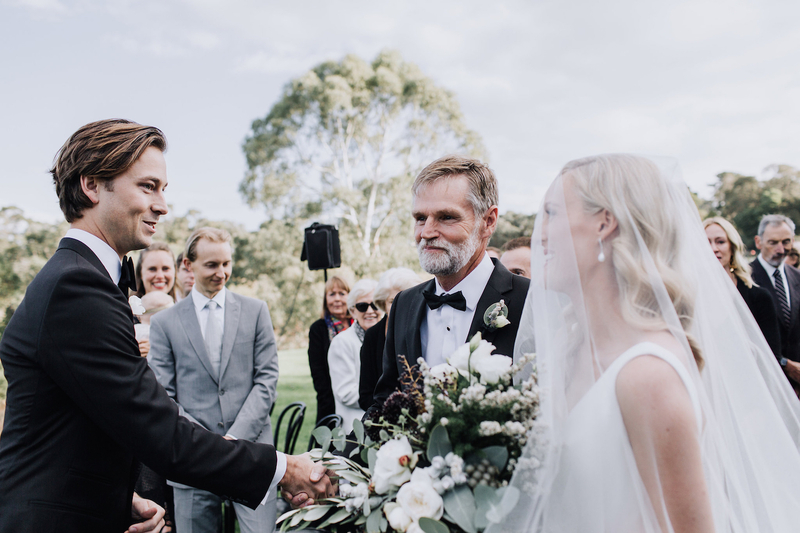 In a laughter filled ceremony at one of Yarra Valley’s newer venues, The Farm Yarra Valley, Ellen and Lachy became husband and wife. Ellen was so on trend in a fabulous Amaline Vitale Bridal & Couture gown (with pockets – always a win in my mind!) as she stood hand in hand with her handsome groom before a giant steel + floral Ceremony Circle by Sassafras Flower Design. Their first kiss brought thunderous cheers and applause before squeals of excitement when I announced that the newlyweds had organized an Easter Egg hunt immediately after! Beautiful images by Anitra Wells / Photographer who is always so fabulous work with!